While distance splinters many extended families, some 4- and 5-year-old Oklahomans have more grandmas and grandpas than they can count. 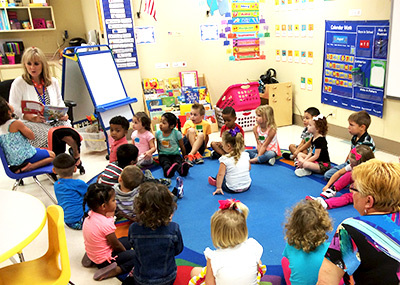 By placing pre-kindergarten classrooms inside nursing homes, some Oklahoma districts are elevating education for their youngest children while simultaneously enhancing the lives of elders in their communities. 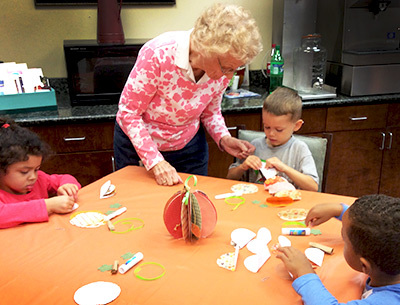 The children affectionately call the nursing home residents their “grandmas” and “grandpas” and interact with them daily through these intergenerational programs. Residents help the children learn the alphabet, build their self-esteem and assist them with simple lessons in science and math. Meanwhile, the children bring joy, purpose and encouragement to the residents. The pairing of small children with older adults is mutually beneficial, said Chris Smith, early childhood director at Enid Public Schools. “For our children, it teaches empathy, social skills and emotional skills, which are so important for 4-year-olds. It does benefit the residents academically as well because the residents read with them. They work with children who are having difficulty, so they get one-on-one attention they might not get otherwise,” Smith said. 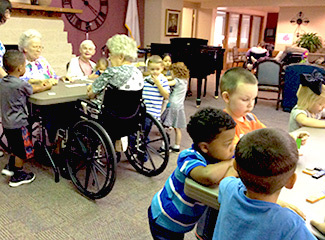 Enid’s program, now in its sixth year, allows students from Carver Early Childhood Center to attend school at The Commons, a local retirement home. Enid adopted its program at a time when it did not have the classroom space for the two classes now sharing an adjoining space at the home. Smith said the program allows residents to feel valuable, some for the first time since they moved to The Commons. By connecting elders with children, Smith said, it helps residents retain or increase their own social and academic skills. Being around the children is a natural motivator for the residents. In Enid, the home’s physical therapy room recently moved into space next to a pre-K classroom. Physical therapists say they have seen huge improvements in how much the residents are willing to work now that they can watch the children through the three large windows that separate the rooms. Amber Fitzgerald is the director of human resources and communications at Enid Public Schools. She says her daughter, who was in the inaugural pre-K class at The Commons, still asks about her grandmas and grandpas. She says the individual attention the children receive is invaluable in getting them ready for kindergarten. “From what I’ve personally witnessed, there is a patience that sometimes someone my age or my 14-year-old daughter’s age doesn’t tend to have with either generation, whether they be our littlest learners or our seniors. I think it’s very special. They just love each other,” Fitzgerald said. 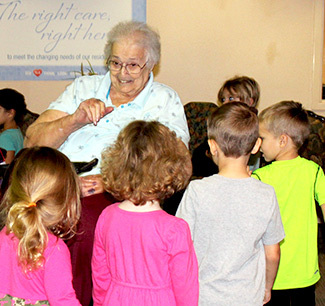 In Clinton, two pre-K classes call United Methodist Retirement and Health Care Center home. Kelly Stephens and Christine Calvert, with a combined 30 years of instruction experience, teach four days at the residence home. On Fridays, they take the kids back to Nance Elementary to reintroduce the children to a traditional school setting. Stephens said her 4-year-olds are learning a unique set of social skills at the residence home. The children share a special connection with the residents even though they are still learning how to converse with adults and some residents may not be able to communicate as well as they used to. Nance Elementary’s intergenerational program is in its fourth year. In addition to regular paired reading times with residents, the children also join them during recreational exercise time, wiggling fingers and circling their arms just like their older book buddies do. In 1999, Jenks Public Schools was the first district in the state to develop an early childhood intergenerational program. Since then, many schools have modeled their own program after Jenks’s success. The district has even had educators visit from as far away as Australia to learn more. Shan Glandon, executive director of teaching and learning in Jenks, credits Don Greiner, CEO of Grace Living Centers, for inspiring the district to launch the program that includes pre-K and kindergarten students. When Greiner was looking at properties for residence homes, he was drawn to space next to the Jenks Early Learning Center. Children and residents connect through dramatic play, a benefit for some who may have lost language or awareness because of a stroke or other illness. Children also learn from the residents, some of whom own pets, which are allowed at the center. The children carry clipboards through the home and interview those elders to learn how to take care of animals and interact with residents through ice cream socials. “You’ll see a child get a favorite ice cream and come lean on the chair of a grandma or grandpa they know, and they’ll just talk. It’s that natural conversation that’s really great,” Glandon said. The district even built three raised gardening beds that are handicap accessible so that residents can help the children dig and plant. “Last spring, a couple of the residents who loved gardening but haven’t been able to do it since they’ve been in the nursing home were quite regular in making sure the three beds were weeded and watered,” Glandon said. Word of the mutual benefits of seniors working with young children is spreading. In addition to Jenks’s and Clinton’s programs, Guthrie’s intergenerational program is in its fourth year, while Muskogee Public Schools launched its program in August.